If you’re asking where can I buy butcher paper, you’ve come to the right place. Gator Paper carries 2 varieties of either butcher paper sheets or choose the bigger size – butcher paper roll. If your looking for white butcher paper, colored butcher paper, or even brown butcher paper, we carry a wide selection of printed butcher paper for any type of business. The classic look of bleached white Butcher Paper or butcher wrapping paper for food service presentation will never get old. 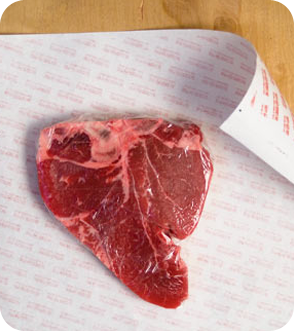 Our medium weight, uncoated Butcher Paper is a great daily use product that can stand up to the toughest demands of the food service industry, but will always serve as the well known meat wrapping paper! This custom printed food service sheet is both durable and multifunctional. It is a butcher block paper favorite among restaurant and butcher shop owners. How much Butcher paper do I need to buy for a custom printed order? The minimum order for custom printed Butcher paper is 3 cases = 3,000 sheets, OR 5 rolls = 3,750 feet (750 feet per roll). Delivering short run custom printed food service products is what we do best! Because they are slow and inefficient! Our goal is to get your printed Butcher paper order delivered as quickly as possible. We work tirelessly to make sure our customer deadlines are met and the quality of our product will keep you coming back for more. If you need your Butcher paper order in a hurry ask one of our sales team members about our Rush Order program. Am I restricted to a small list of standard sheet sizes? No! We do offer a list of standard sheet sizes to help keep your overall project costs down, however, we can also custom cut your sheet size to any desired width and length needed to fit your application. Butcher Paper can be printed with up to 2 spot PMS colors. Sometimes, a screen of either existing PMS color can be made to add the look of a third or fourth color if needed. We can match any standard PMS color on the chart and some metallic colors. We’d like to think the sky is the limit, but unfortunately it’s not in this case. 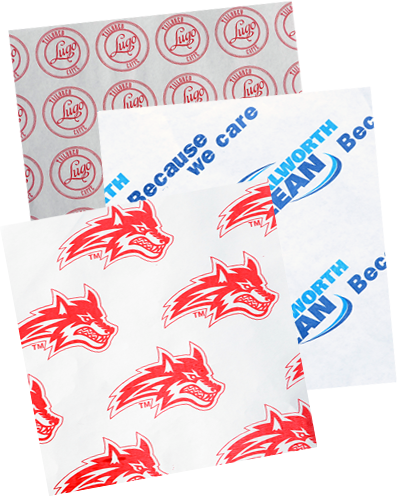 Short run food paper orders are limited to a basic step and repeat pattern of one or more logos, or a full page pattern design that is step and repeated down the paper before cutting. Our talented art department will work closely with you to come up with a creative solution to any brand design challenge. Don’t ask where to buy butcher paper, call Gator paper today and advertise your business like the pro’s. Show off business logo when your customers walk out the door on your custom printed Butcher paper. Need a price quote on custom printed Butcher Paper? Contact us today! Looking for a coated Butcher Paper option? Then look no further than our custom printed Freezer Paper! If Freezer Paper isn’t strong enough to do the job…nothing will!